The Jr Victorians and Jr Orangerie Greenhouses are members of the premier greenhouses in the Helios line of greenhouses from Janssens of Belgium. 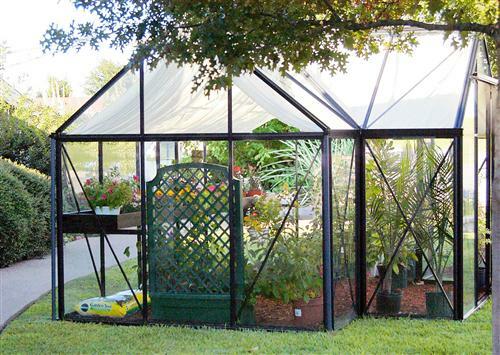 This company has been making high-end glass greenhouses for over 30 years. 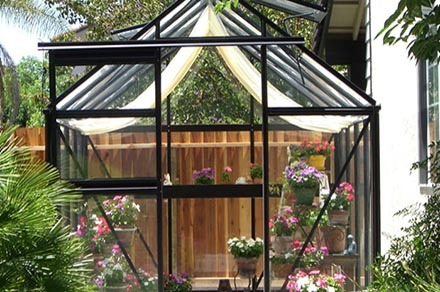 Since the introduction of the original Victorian model, in 1999, Janssens have become a leading supplier of this style of greenhouse in Europe. Exaco are proud to now be the USA distributor of these very fine greenhouses. These classic greenhouse designs not only provide a first-class quality greenhouse environment, they also add significant old fashioned English beauty and style to your backyard. Janssens has improved on the overall design of these greenhouses, while also improving the internal growing environment, and still maintaining a better price than other greenhouses of this calibre. View the 2018 Structural Certification Letter for Jr Victorian Orangerie Greenhouse including wind and snow load ratings. Scroll down to see info and specifications on all models. Why Buy a Jr Victorian Greenhouse? 2017 Update - Now using heavier duty "square" hollw tube framing as Royal Victorian greenhouses. Uses 4mm tempered glass while other use only 3 mm glass. Aluminum Profiles are thicker & stronger than those of most competitors in this price range. Glass panels are held in place with substantial rubber seals. Providing better insulation. Others use only metal clips. One sliding door – can be installed on gable ends. Color of Aluminum Profiles: Black (RAL9005m). T.U.V. & GS tested and approved (similar to UL testing & listing). Includes: large gutters with down spouts. Bottom-line: The Junior Victorian & Junior Orangerie greenhouses are better quality, more attractive and better insulated than other glass greenhouses in their price range. 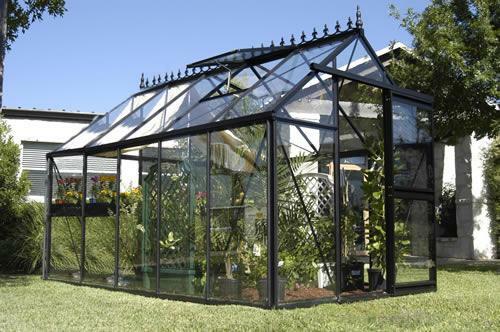 The Junior Victorian model V23 Greenhouse provides the ideal, year-round, gardening environment while combining Old World Style with modern European engineering and craftsmanship. 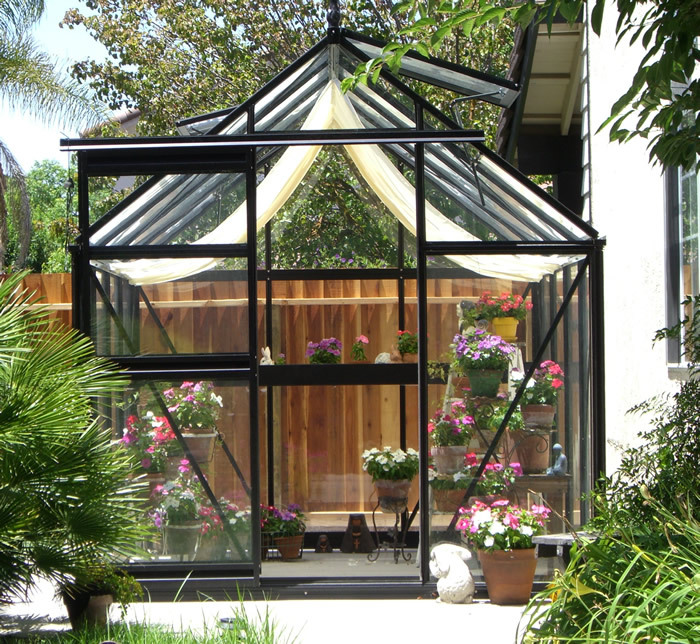 The elegant black aluminum framework, tempered glass panels; abundant 5' side walls and 8'2" peak height combine to give you a beautiful greenhouse while providing you with 79 sq ft of comfortable interior workspace. Whether you are over-wintering special or valuable plants, starting seedlings or creating a tropical jungle, you can enjoy years of maintenance free use. The Junior Victorians have 2 automatic roof windows, 2 full-length gutters and downspouts, shade cloths, and measure 7’ 9” wide X 10’ 2” deep. 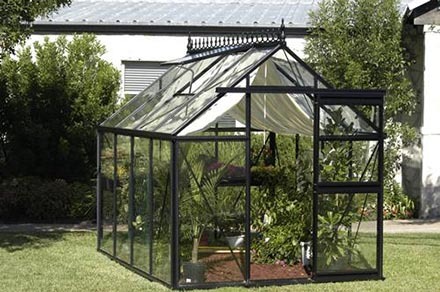 The Junior Victorian model V24 Greenhouse is a bit larger than the 23, and provides the same ideal, year-round, gardening environment while combining Old World Style with modern European engineering and craftsmanship. 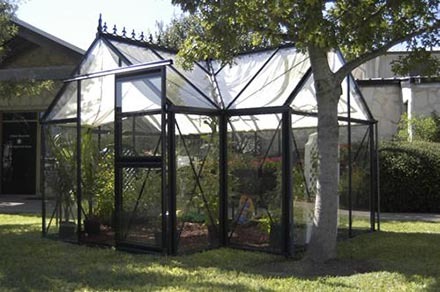 The elegant black aluminum framework, tempered glass panels; abundant 5' side walls and 8'2" peak height combine to give you a beautiful greenhouse while providing you with 97 sq ft of comfortable interior workspace. Whether you are over-wintering special or valuable plants, starting seedlings or creating a tropical jungle, you can enjoy years of maintenance free use. The V24 Junior Victorians have 2 automatic roof windows, 2 full-length gutters and downspouts, shade cloths, and measure 7’ 9” wide X 12’ 6” deep. The Junior Orangerie is the most unusual and most appealing greenhouse on the market today. The elegant black framework, Old World Style, and European engineering combined with 5’ side walls and 8’ 2’ peak height give the gardener a comfortable 114 square feet of interior workspace. 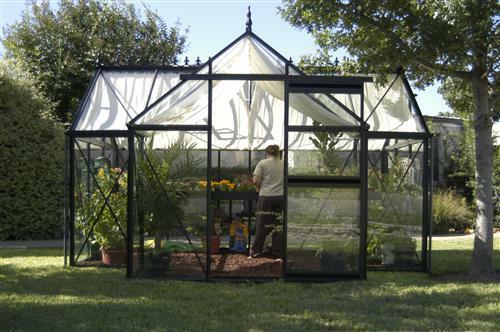 The greenhouse comes with 2 automatic roof openers, a roof gutter system, and sliding glass door. This is truly a must see, must have gardener’s dream. Hello, I am considering a junior greenhouse. What is the best way you suggest to anchor into ground for this type greenhouse?